Merck & Co. plans to develop new solid tumor cancer immunotherapies using Dragonfly Therapeutics’ Tri-specific NK cell Engagement Therapies (TriNKET™) technology platform, through a collaboration that Dragonfly said could generate for it up to $695 million per program, plus royalties. Neither the number of programs, nor the types of solid tumor malignancies, were disclosed. The collaboration grants Merck the option to license exclusive worldwide intellectual property rights to products developed using Dragonfly’s proprietary TriNKETs, designed to bind to the proteins expressed on both cancer cells and tumor cell-killing NK cells. Through that binding, Dragonfly says, the TriNKETs are intended to stimulate NK cells, making them aware of the cancer and allowing them to both directly kill the cancer cells, and activate T cells and B cells to attack the cancer, helping B cells produce antitumor antibodies and activating more T cells to kill tumor cells. Dragonfly reasons that its TriNKETs amplify the effectiveness of T cells by acting as a sentinel that calls other immune system cells to attack the cancer, as well as broadening the therapeutic window by using their special characteristics of distinguishing cancer to more specifically target tumor cells. Dragonfly aims to expand its pipeline, which now consists of six preclinical candidates: a solid tumor targeting candidate, DF1001, four blood tumor targeting candidates (DF2001, DF3001, DF4001, and DF5001), and a TriNKET Enhancer, DF6000. 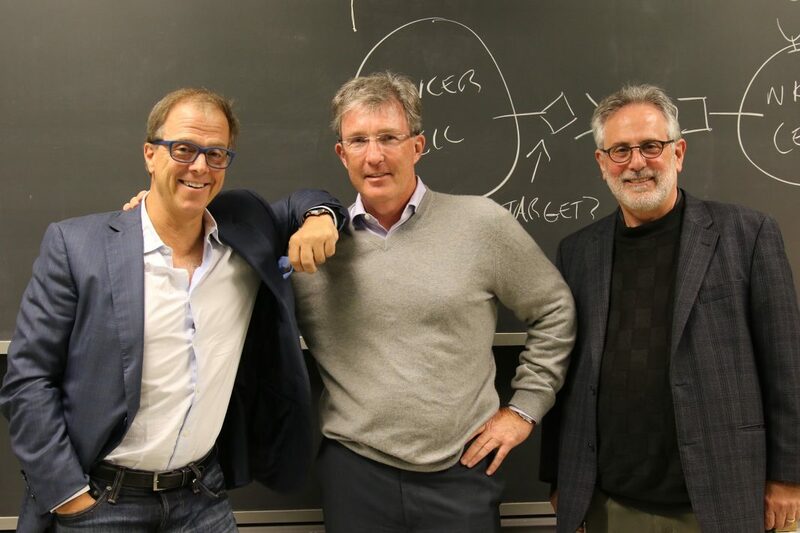 Established in 2015, Dragonfly’s founders include Tyler Jacks, Ph.D., head of the Koch Institute for Integrative Cancer Research at MIT, and chair of the company’s Scientific Advisory Board; David Raulet, Ph.D., the Esther and Wendy Schekman Chair in Cancer Biology at University of California, Berkeley; and filmmaker, inventor, and technology entrepreneur Bill Haney, who serves as Dragonfly’s CEO. Through his film industry background, Haney secured investment for Dragonfly from private wealth management advisory firms or “family offices” that include one associated with the great-nephew of Walt Disney, Tim Disney. Members of Dragonfly’s Scientific Advisory Board include Harold Varmus, M.D., the Nobel laureate and former director of the NIH and its National Cancer Institute, now the Lewis Thomas University professor of medicine at Weill Cornell Medicine and a senior associate at the New York Genome Center. He is a co-recipient of the 1989 Nobel Prize in Physiology or Medicine for the discovery of the cellular origin of retroviral oncogenes. “We’re excited to work with Merck to accelerate bringing drug candidates developed using our innovative TriNKET technology platform to patients with a number of solid tumor malignancies,” Haney said in a statement. “We are thrilled to add new partner Merck for some very exciting solid tumor cancer targets. Celgene has been a wonderful partner and we look forward to working with Merck as well,” Dragonfly tweeted this morning.